In her newest project, Nightvision Series (2014-15), Carleen Sheehan combines a range of media, including drawing, painting, photography and printmaking. A central focus of Sheehan’s work has been the intensity of contemporary space, with its heightened temporal shifts and collaged experiences. The imagery here celebrates the spectacle of the natural, often juxtaposing it within the flux of mechanization and the built environment. She relies on the inter-connectedness of visual forms and processes across categories and disciplines, and on the descriptive qualities inherent to different levels of visual information. Each of the paintings on view starts with a photographic layer of archival inkjet prints on Kozumi paper, which are mounted to the canvas. 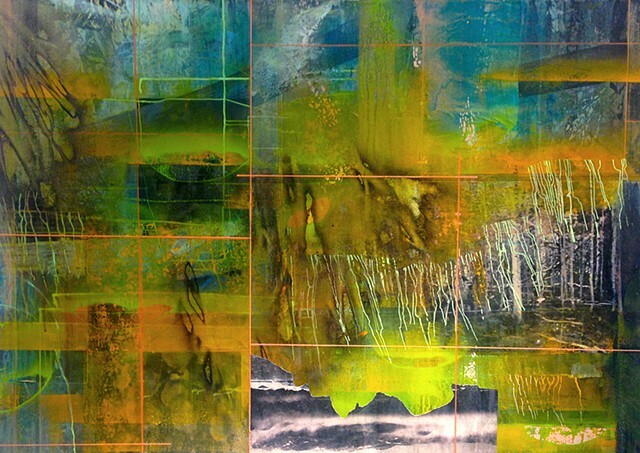 The paintings develop through a process of accrual and erosion, creating a layered surface embedded with image fragments and shifts in color and light. Sheehan will be traveling in June 2016 as part of the Arctic Circle Residency, a collaborative sailing expedition to the high-Arctic off the coast of Norway, where she will work with both photography and painting. In conjunction with this project, she has been invited to be a Guest Scholar at the Fulbright Arctic Initiative Annual Conference in New York in Fall 2016, to show my work and report on the research conducted during the expedition.